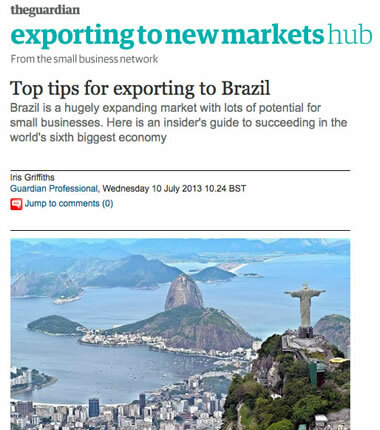 Brazil is a hugely expanding market with lots of potential for small businesses. Here is an insider’s guide to succeeding in the world’s sixth biggest economy. As the sixth biggest economy in the world, it’s no surprise that Brazil is receiving a lot of attention from the international business community. The potential is huge and for those keen to venture into this expanding market and make their fortune in Brazil, countless opportunities exist in a huge range of sectors. Encouraged by all the success stories, the number of new businesses registered in Brazil grew from 680,881 in 2009 to 1,370,460 in 2010. While many of these will reap the financial rewards of doing business in this vibrant country, many will inevitably fail, and unnecessarily so. The problem? Cultural business shock. The solution? Do your homework. Brazil has 26 states and one federal district distributed in five regions: north, south, north-east, south-east and central-west. The Portuguese language is the main thing all regions have in common. However, each state or region has a unique cultural profile and a way of doing business – even their tax systems can be different. Other issues mentioned included an under-developed infrastructure, language difficulties (little English is spoken in Brazil), costly products and services, a relaxed approach to time-keeping, the influence of social culture on business practices, lack of planning and the Brazilian conviction that it’s rude to say no. Inflexibility in adapting to the business culture of Brazil can deter businesses in their initial approach to the market and can hinder their potential even after the first, most obvious hurdles are overcome. Patience and persistence emerged as the keywords for success among those foreign businesses that have already entered the Brazilian market. One of our main tips for overcoming obstacles in Brazil is to be open to new relationships. Brazilians are friendly. Creating personal relationships and taking the time to know the person behind the decision-maker opens up advantages to all those planning a long-term investment and achieving success in the country. It is also important to learn to appreciate the human element of business from the outset and to be prepared to dedicate time in building relationships. Brazil has well-qualified professionals. They are highly skilled and adjust well to pressure. The Brazilians are enthusiastic, innovative, flexible and well known for their optimistic disposition. Their ethnic make-up, composed of a mixture of cultures, seems to be a factor that makes them feel comfortable when dealing with foreigners. Before going to Brazil, research the market, the desire for your product or service and your customer’s expectations from the outset. Brazil requires the same products and services as any other market across the globe but you will have to adapt to local market specifics and may well have to give your brand a Brazilian face. Choose your location with care. International companies entering the country may be tempted to think that because all Brazilians speak Portuguese, they all think and consume the same. Sometimes, the business approach that works well in one region will not succeed in another. Just as with any business venture, think ahead and plan well for risks. Minimise your risks by seeking the support of reliable business professionals fully conversant with Brazilian business culture and learn how to use the country’s warm welcome to foreign businesses in your favour. Keep an open mind when looking for the right local partner for your business and seek recommendations from trusted business contacts. Brazil can be an exciting and potentially lucrative market in which your business can be highly successful – provided you do your homework first.